Gosh, here it is August already. I know a lot of people love summer because the weather is warm. I prefer the other seasons. Fall, winter, and spring are much more comfortable seasons in Northern California. The fires are so bad this year. My heart goes out to my fellow Californians who are suffering from the fires. Also many kudos and thanks to the firefighters! Today’s dinner is really more of a cool weather dish. 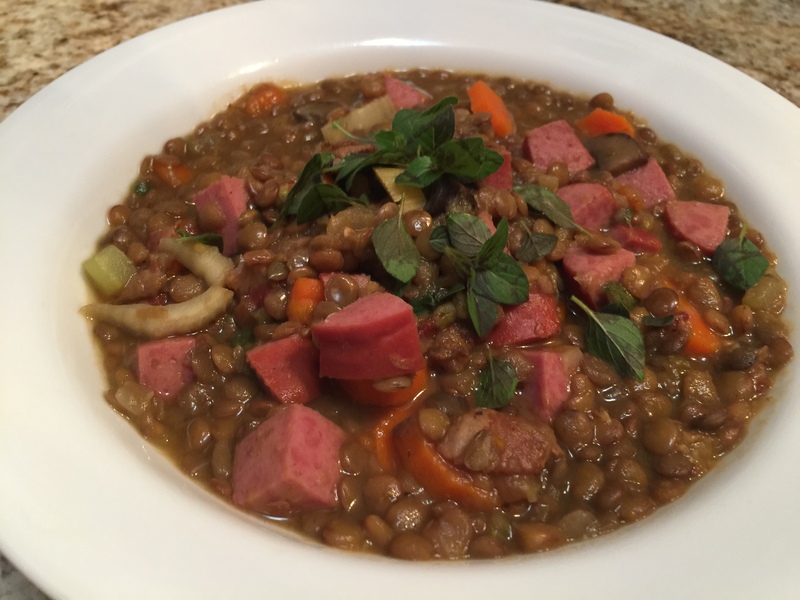 Lentils are a quick cooking legume and have a delicious earthy flavor. We add turkey sausage, carrots, onions, celery, and a lone mushroom into our stew. I top mine with some fresh oregano from the garden. It turns out very tasty. It helps that we have not prepared this in a long time so the taste is unexpected. This entry was posted in American, Legumes, Poultry, Vegetables and tagged carrots, Celery, lentils, Onions, oregano, smoked turkey sausage. Bookmark the permalink.